This article is about the city in Argentina. For other uses, see Salta (disambiguation). (From top to bottom; from left to right) View of the city from top of San Bernardo Hill; Colonial Cabildo; Cathedral of Salta; Ninth of July Plaza and the Victoria Theatre. Salta (Spanish pronunciation: [ˈsalta]) is a city located in the Lerma Valley, at 1,152 metres (3780 feet) above sea level in the northwest part of Argentina. 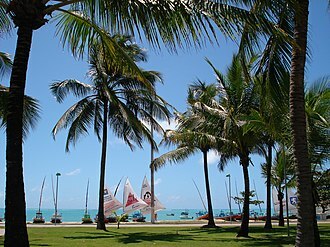 It is also the name for the capital city of Salta Province. Along with its metropolitan area, it has a population of 619,000 inhabitants, which makes it the second most populated city in the northwest of the country. It is situated in the Lerma Valley, 1,152 metres (3,780 ft) above sea level, at the foothills of the Andes mountains. The weather is warm and dry, with annual averages of 756 millimetres (29.8 in) of rainfall and an average temperature of 16.4 °C (61.5 °F) (20.4 °C [68.7 °F] in summer, 10.8 °C [51.4 °F] in winter). 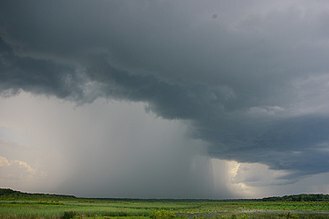 January, February and March are the months with the greatest rainfall. During the spring, Salta is occasionally plagued by severe, week-long dust storms. Nicknamed Salta la Linda ("Salta the beautiful"), it has become a major tourist destination due to its old, colonial architecture, tourism friendliness, excellent weather and natural scenery of the valleys westward. Attractions in the city proper include the 18th century Cabildo, the neo-classical style Cathedral, and the 9 de julio central square along with San Bernardo hill and its surroundings. The city's museums exhibit a wide range of artifacts and art work from the native civilizations that flourished in the area (Salta is located in the southernmost region of what was the Inca empire, belonging to the Collasuyu, one of the four areas of the empire until the Spanish conquest), as well as from the 16th century Spanish conquest and the colonial and post-colonial periods. Salta used to be the starting point of the "Train to the Clouds" (Tren a las nubes), and on the way to red-soiled Cafayate, as well as to other nearby tourist destinations. The Martín Miguel de Güemes Airport, 6 kilometres (3.7 miles) 6 kilometres southwest of the city, has regular domestic flights to Buenos Aires, Tucumán, Jujuy, Córdoba, Puerto Iguazú; and international flights to Asunción, Rio de Janeiro, Iquique, Lima and Santa Cruz de la Sierra. 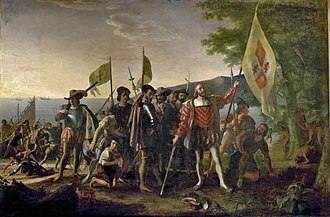 Salta was founded on April 16, 1582 by the Spanish conquistador Hernando de Lerma, who intended the settlement to be an outpost between Lima, Peru and Buenos Aires. The origin of the name Salta is a matter of conjecture, with several theories being advanced to explain it. Salta has a subtropical highland climate (Cwb, according to the Köppen climate classification), and it is characterized by pleasant weather year-round. Located in the subtropical north, but at an altitude of 1,200 metres, Salta enjoys 4 distinct seasons: summers are warm with frequent thunderstorms, with daytime highs around 26 to 28 °C (78.8 to 82.4 °F) and pleasant, refreshing nights around 15 or 16 °C (59 or 61 °F). Fall brings dry weather, pleasant days at around 22 °C (71.6 °F) and mild nights at around 10 °C (50.0 °F). By winter, the dryness is extreme, with very few rain episodes. 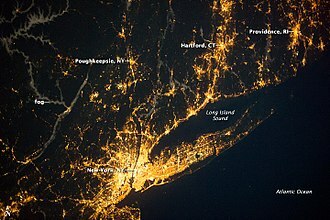 Nights are cool at 3 °C (37.4 °F) on average, but daytime heating allows for high temperatures of 19 °C (66.2 °F). Snow is rare and frost is quite common, with temperatures reaching down to −7 °C (19.4 °F) during the coldest nights. Spring brings sunny weather with warm days and mild nights: days range from 25 to 28 °C (77.0 to 82.4 °F) with nights between 10 to 14 °C (50.0 to 57.2 °F). Salta's winters are rather warm for its elevation and far inland position for a location being just outside the tropics. Of the over 700 millimetres (28 in) of rain that Salta receives yearly, over 80% falls between December and March, when thunderstorms occur almost daily. During the rest of the year, blue skies dominate the region. Seemingly incessant summer thunderstorms greatly rejuvenate the surrounding mountainous landscape, making the various hills and mountainsides within the vicinity of the city green and lush once again. Salta receives 1863 hours of bright sunshine each year or about 5.1 hours per day. The highest recorded temperature was 39.9 °C (103.8 °F) on November 28, 1972 while the lowest recorded temperature was −9.4 °C (15.1 °F) on August 5, 1966. The city centre features a number of buildings dating back to the 18th and 19th and early 20th centuries. Clockwise around the Ninth of July Square are the neoclassical Cathedral Shrine, the French style Museum of Contemporary Art, the Cabildo (in former times, the city's town hall, nowadays a historical museum) and the neoclassical Museum of High Mountain Archaeology, which houses artifacts from the Inca civilization, including the mummies of three Inca children. The Plaza is almost completely surrounded by a gallery. Within walking distance of the 9th July Square are the Saint Francis Church and the city's three pedestrian streets: Alberdi, Florida and "Caseros". The three blocks in Balcarce street closest to the train station are now the centre of night life in Salta, with restaurants, pubs and cafés on both sidewalks and concerts every night. Rising in the east is San Bernardo Hill. Its summit, from which visitors can get a view of the city and the entire valley, can be reached by car, cable car or stairway. Salta is probably the most Spanish city in Argentina by physical appearance: so much so that tourists visiting from Spain often find a strong resemblance between Salta and Andalucian cities. The local culture, however, is a blend of Spanish and gaucho (mestizo, criollo, both indigenous and non-indigenous) traditions, lending the city a distinctive identity, somewhat different from the more European-like metropolises to the south. Salta residents, like most Argentines, are very enthusiastic about football. The most important local clubs are Juventud Antoniana, Gimnasia y Tiro de Salta, and Central Norte; many faithful fans follow each. These three clubs currently play in the third national division. Other locally popular sports include baseball (a game in which Salta players excel nationally), basketball, volleyball, rugby, and mountaineering. The main sporting venue in Salta is the Padre Ernesto Martearena Stadium; the Gimnasia y Tiro and Juventud Antoniana stadiums also see many athletic matches. The largest roofed facility in the city is the Ciudad de Salta Stadium, chiefly used for basketball, volleyball, and boxing. Over the last twenty years, Salta has played host to such high-profile international sporting events as the 1990 Basketball World Cup, the 1994 Camel Trophy, the 2002 Volleyball World Cup, and the 2009 Hockey Champions Challenge. The Argentina national rugby union team, the "Pumas", have played in Salta against Italy (2005), England (2009), (2013). and South Africa (2016.) Top football clubs, including Boca Juniors, River Plate and Racing, have played friendly games in Salta in summer, off-season matches. The city was used as a stage on the route of the 2014 and 2016 Dakar Rally. Salta is governed by a city council of 21 members. Following the elections of November 2013 the Workers' Party has 9 seats, the Justicialist Party has 6 seats, and there are 6 others. The film Taras Bulba, starring Yul Brynner and Tony Curtis, was largely shot in the hills west of the city, near San Lorenzo. Actor John Schneider (The Dukes of Hazzard and Smallville) was part of the cast of Cocaine Wars, another film shot in Salta. Two Hollywood celebrities have married Salta natives: Matt Damon (to Luciana Bozán Barroso), and Robert Duvall (to Luciana Pedraza). ^ "Historia y Geografía" (in Spanish). Municipality of Salta. Retrieved 5 February 2018. ^ "Datos Climáticos de Argentina: Annuales" (in Spanish). Retrieved April 12, 2013. ^ a b "Station Salta" (in French). Meteo Climat. Retrieved October 8, 2016. ^ a b "Salta, Salta". Estadísticas meteorológicas decadiales (in Spanish). Oficina de Riesgo Agropecuario. Retrieved June 19, 2015. ^ "Estadísticas Climatológicas Normales – período 1981–2010" (in Spanish). Servicio Meteorológico Nacional. Retrieved January 18, 2018. ^ "Salta Aero Climate Normals 1961–1990". National Oceanic and Atmospheric Administration. Retrieved June 19, 2015. ^ "Datos bioclimáticos de 173 localidades argentinas–Junio". Atlas Bioclimáticos (in Spanish). Universidad Nacional de La Plata. Retrieved June 19, 2015. ^ "Estación Meteorológica (EM) Cerrillos-INTA" (in Spanish). Instituto Nacional de Tecnología Agropecuaria. Retrieved July 13, 2015. ^ "Estación Meteorológica (EM) Cerrillos-INTA: Temperatura Máxima Absoluta (ºC ) – Periodo 1969– 2009" (in Spanish). Instituto Nacional de Tecnología Agropecuaria. Retrieved July 13, 2015. ^ "Estación Meteorológica (EM) Cerrillos-INTA: Temperatura Máxima Media (ºC ) – Periodo 1969– 2009" (in Spanish). Instituto Nacional de Tecnología Agropecuaria. Retrieved July 13, 2015. ^ "Estación Meteorológica (EM) Cerrillos-INTA: Temperatura Media (ºC ) – Periodo 1969– 2009" (in Spanish). Instituto Nacional de Tecnología Agropecuaria. Retrieved July 13, 2015. ^ "Estación Meteorológica (EM) Cerrillos-INTA: Temperatura Mínima Media (ºC ) – Periodo 1969– 2009" (in Spanish). Instituto Nacional de Tecnología Agropecuaria. Retrieved July 13, 2015. ^ "Estación Meteorológica (EM) Cerrillos-INTA: Temperatura Mínima Absoluta (ºC ) – Periodo 1969– 2009" (in Spanish). Instituto Nacional de Tecnología Agropecuaria. Retrieved July 13, 2015. ^ "Estación Meteorológica (EM) Cerrillos-INTA: Precipitaciones Mensuales Periodo 1969 – 2009" (in Spanish). Instituto Nacional de Tecnología Agropecuaria. Retrieved July 13, 2015. ^ "Estación Meteorológica (EM) Cerrillos-INTA: Humdedad Relativa Media (%) Periodo 1969 – 2009" (in Spanish). Instituto Nacional de Tecnología Agropecuaria. Retrieved July 13, 2015. ^ "Estación Meteorológica (EM) Cerrillos-INTA: Heliofanía Relativa (Duración relativa del brillo solar) Periodo 1969 – 2009" (in Spanish). Instituto Nacional de Tecnología Agropecuaria. Retrieved July 13, 2015. ^ "Estación Meteorológica (EM) Cerrillos-INTA: Heliofanía Efectiva (Duración registrada del brillo solar) Periodo 1969 – 2009" (in Spanish). Instituto Nacional de Tecnología Agropecuaria. Retrieved July 13, 2015. 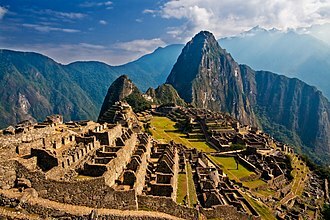 ^ "Mummified Inca maiden wows crowds". BBC News. 2007-09-07. Retrieved 2014-04-22. ^ "England too strong for Argentina". Espn.co.uk. Retrieved 2014-04-22. ^ "Argentina v South Africa – Rugby Union". BBC Sport. Retrieved 13 October 2017. 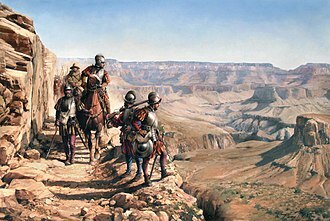 ^ "CCA: When the pueblo was Hollywwod". Cca.edu. 2010-02-05. Retrieved 2014-04-22. ^ juliana (2006-07-12). "Robert Duvall's House of Jasmines". Hotelchatter.com. Retrieved 2014-04-22. 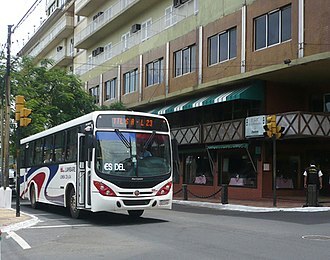 Municipality of Salta — Official website. Government of Salta Province — Official website. City history at the Chamber of Deputies website. "Salta. The capital of the Province of Salta, Argentina" . New International Encyclopedia. 1905. "Salta" . The American Cyclopædia. 1879. 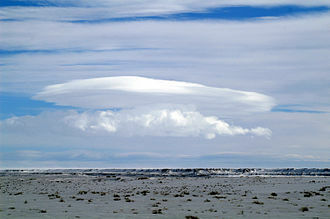 Santa Cruz de la Sierra, commonly known as Santa Cruz, is the capital of the Santa Cruz department in eastern Bolivia. It was not until after World War II and profound agrarian and this has helped make Santa Cruz the most important business center in Bolivia and the preferred destination of migrants from all over the country. 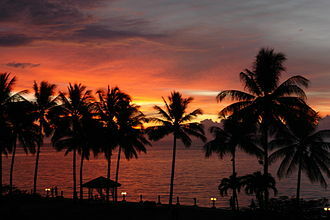 However, recent data suggests that the current location of the city of Santa Cruz was inhabited by an Arawak tribe that came to be known by the Spanish as Chané. Remains of ceramics and weapons have been found in the area, the settlement was named after Chaves’s home town in Extremadura, where he grew up before venturing to America. Shortly after the founding, attacks from local tribes became commonplace, many of the inhabitants, chose to stay behind and continued living in the original location. On September 13,1590 the city was moved to the banks of the Guapay Empero river. Nevertheless, the proved to be even more severe at the new location forcing the settlers to relocate once again on May 21,1595. After they moved the city was consolidated in 1622 and took its original name of Santa Cruz de la Sierra given by Ñuflo de Chaves over 60 years before. Remnants of the settlement can be visited in Santa Cruz la Vieja. Over the next 200 years, several tribes were incorporated under Spanish control or defeated by force. The efforts for consolidating the borders of the Empire were not overlooked by the authorities in Lima, the province was ruled by a Captain General based in Santa Cruz, and, in turn, the city government was administered by two mayors and a council of four people. 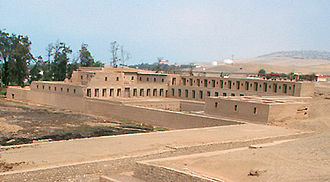 Citizens of Santa Cruz were exempt from all taxes and the mita system used in the rest of the Viceroyalty of Peru was not practiced. 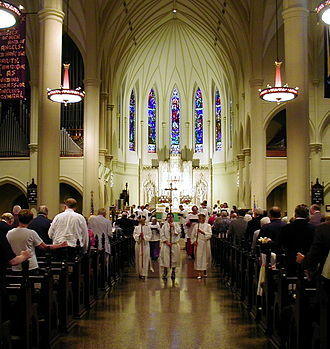 However, in spite of its importance, the city did not grow much in colonial times. Most of the activity was centered in the mining centers of the west. 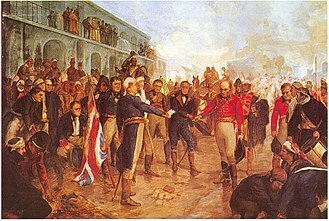 Animosity towards imperial authorities began at the turn of the 18th century, the seat of government was taken away from the city and moved to Cochabamba, and many of the powers delegated by the viceroyalty were now in the hands of appointees of the crown. A junta of local commanders took control of the government in his place, by 1813 the city was once again under imperial control. Cambiemos is an Argentine big tent political coalition created in 2015. 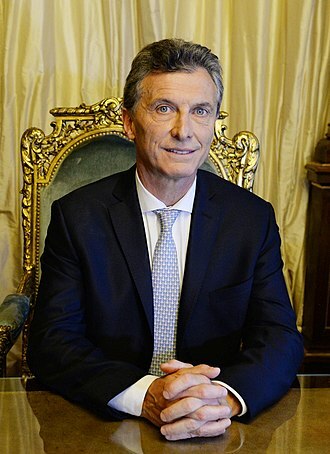 It is composed of the Republican Proposal, the Radical Civic Union, on 9 August 2015 Mauricio Macri was elected as the candidate who would represent Cambiemos in the presidential election, on 22 November he won the presidential election. Initially, the pre-candidates Mauricio Macri, Daniel Scioli, and Sergio Massa had a tie in the polls for the 2015 presidential election. The other parties created a coalition, the Broad Front UNEN. Elisa Carrió, leader of the Civic Coalition, left UNEN, both of them would run in the primary elections. The Radical Civic Union was divided, Ernesto Sanz proposed to join Macri as well, the party held a convention to decide what to do, and Sanzs proposal prevailed. Thus, the UCR left UNEN and joined the PRO-CC, the new coalition was named Cambiemos, suggesting a change from the 12-year long rule of center-left Kirchnerists. Macri and Carrió ran to be the nominee in the elections with Macri winning by a wide margin. The Tren a las Nubes is a tourist train service in Salta Province, Argentina. The railway line has 29 bridges,21 tunnels,13 viaducts,2 spirals and 2 zigzags, because of the design decision not to use a rack-and-pinion for traction, the route had to be designed to avoid steep grades. The zigzags allow the train to climb up driving back and forth parallel to the slope of the mountain and it departs from Salta every Saturday at 07,05, and returns around midnight, though most tourists simply do the 8-hour one-way trip and return by other means. The train is composed of a carriage, bar carriage. Currently, the train leaves Salta station for the 15-hour, 434-kilometre round trip to the Polvorilla viaduct, the curved viaduct is 224 m long and 64 m high. Once the train has left Salta, it first enters the Valle de Lerma, there are numerous stops along the way, some with markets selling artisan goods and locals offering regional cuisine. Construction of the railway started in 1921, with the intention of connecting the North of Argentina with Chile across the Andes. The La Polvorilla viaduct, the highest of the line, was finished on 7 November 1932, the route was designed by American engineer Richard Maury, and after whom one of the stations has been named. The complete railway was inaugurated on 20 February 1948, following numerous delays and complications, the footage was offered to the Clarín newspaper to make a documentary, which was subsequently called Tren a las Nubes because of the vapour clouds in the film. Ferrocarriles Argentinos adopted the name to make it appealing to tourists. It was not until 1972 began being used by tourists as a heritage railway. In 2005 a train stopped at a 3, 500m height, the train was again opened to the public on 6 August 2008, In July 2014 a train derailed near Abra Muñano, at a 4, 000m height, 80km. Before reaching San Antonio de los Cobres, about 400 passengers had to be evacuated from the train. After the incident, the Government of Salta rescinded the contract with Ecotren, following these events, the service was re-nationalised and the Province took over the operation and maintenance of the service. A cabildo or ayuntamiento was a Spanish colonial, and early post-colonial, administrative council which governed a municipality. 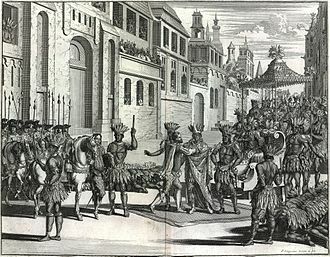 Cabildos were sometimes appointed, sometimes elected, but they were considered to be representative of all land-owning heads of household, the colonial cabildo was essentially the same as the one developed in medieval Castile. 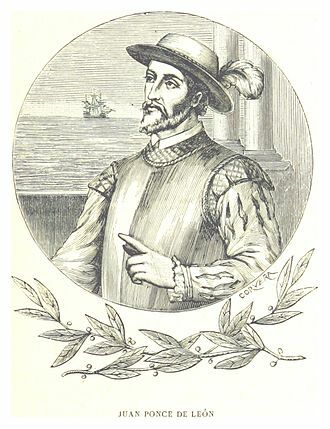 For example, Hernán Cortés established La Villa Rica de la Vera Cruz to free himself from the authority of the Governor of Cuba. 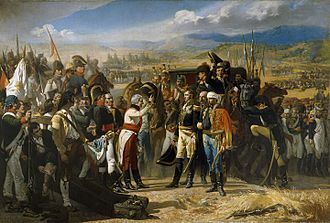 The word cabildo has the same Latin root as the English word chapter, historically the term ayuntamiento was often preceded by the word excelentísimo as a style of office, when referring to the council. This phrase is often abbreviated Exc. mo Ay, with the collapse of the Western Roman Empire and the establishment of the Visigothic Kingdom, the ancient municipal government vanished. 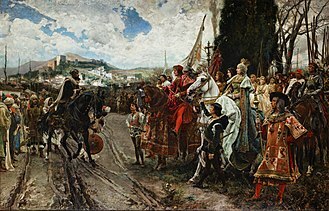 In areas where the old territoria survived, the Visigothic kings appointed a single officer, after the Muslim conquest, the new rulers appointed various judicial officers to manage the affairs of the cities. Qadis heard any cases that fell under the purview of Sharia law and sahibs oversaw the administration of the other areas of urban life, such as the markets. 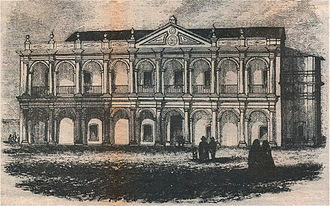 The cabildo proper began its evolution in the process of the Reconquista. These new bodies took their permanent form by the end of the 14th century, as part of the same process, a municipal council with different attributes and composition evolved in the neighboring Kingdom of Aragon during this period. In theory, every municipality in the Spanish colonies in the Americas, municipalities were not just the cities but included the surrounding lands. All lands were assigned to a municipality. Usually the cabildo made local laws and reported to the presidente of the audiencia, the cabildo had judicial and administrative duties. For this reason it was addressed with the formula, Consejo. 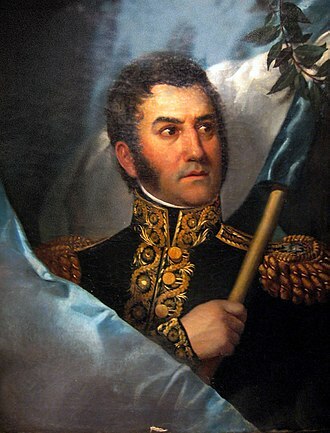 The cabildo consisted of types of officials. There were four to twelve regidores, depending on the size, were not just deliberative officers, but all shared in the administration of the territory, dividing tasks among themselves. Italian Argentines are Argentine-born citizens of Italian descent or Italian-born people who reside in Argentina. After Spain, Italy is the second largest ethnic origin of modern Argentines, Italian settlement in Argentina, along with Spanish settlement, formed the backbone of todays Argentine society. Argentine culture has significant connections to Italian culture in terms of language, small groups of Italians started to immigrate to Argentina as early as the second half of the 18th century. In 1914, the city of Buenos Aires alone had more than 300,000 Italian-born inhabitants, after the end of World War II, Italy was reduced to rubble and occupied by foreign armies. The period 1946–1957 brought another wave of 380,000 Italians to Argentina. 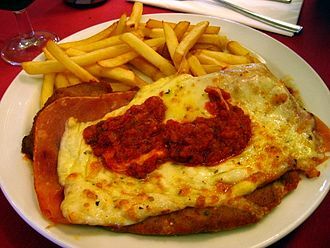 Today, there are still 527,570 Italian citizens living in the Argentine Republic, in Argentine slang, tano is still used for all people of Italian descent where it originally means inhabitant of the former independent state the Kingdom of Naples. 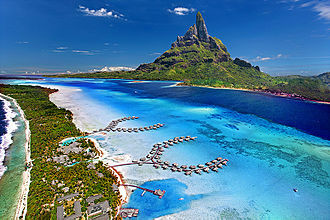 In comparison to Brazil and Uruguay, Argentina received more people from the South of Italy, the assumption that emigration from cities was negligible has an important exception, and that is the city of Naples. The city went from being the capital of its own kingdom in 1860 to being just another large city in Italy, the loss of bureaucratic jobs and the subsequently declining financial situation led to high unemployment. In the early 1880s epidemics of cholera struck the city. According to a study in 1990, considering the proportion of returnees. Southern Italians indicate a permanent settlement. The authors conclude that the Argentinean society in its Italian component is the result of Southern rather than Northern influences, according to Ethnologue, Argentina has more than 1,500,000 Italian speakers, making it the second most spoken language in the nation. This prevented any expansion of the use of the Italian language as a language in Argentina. The similarity of the Italian dialects with Spanish enabled the immigrants to assimilate, by using the Spanish language, Italian immigration from the second half of the 19th century to the beginning of the 20th century made a lasting and significant impact on the intonation of Argentinas vernacular Spanish. The train during the first trip after its closure, April 2015. Rocío Chalup, Queen of the Arab community in the Fiesta Nacional del Inmigrante in Oberá, Misiones.